Everyone who lives and works in Benziger Winery, Sonoma, The Wine Industry, California have been hoping, praying and dancing for rain all year. Faced with one of the worst droughts in recent history, the US Drought Monitor deemed over 82% of California in “Extreme Drought” as of last month. This is distressing information for anyone working in one of California’s many agricultural industries, and the wine industry is no exception. Our vines need water to survive, thrive and continue producing great wines. All year, our focus has been on proactive management of our soils and viticulture practices to conserve water and keep our vineyards healthy. Below is a photo from NASA that was exhibited at the Annual Unified Wine and Grape Symposium in Sacramento early this year. 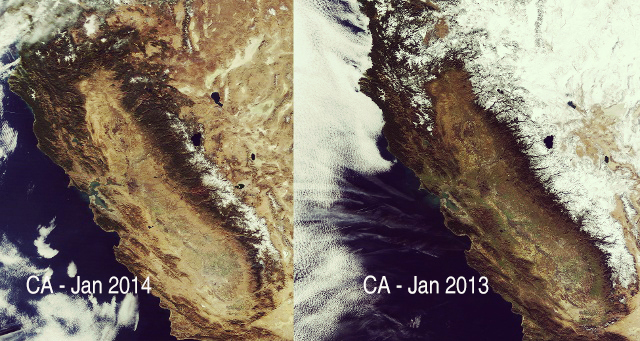 It shows an aerial shot of California in January, 2013 right next to one taken in January, 2014. The effect of the drought is obvious. And the rest of 2014 was almost just as dry. Until now. Last week, we got several inches of rain. The rivers rose and everything got greener, we were extremely thankful to have the much-needed water. With the exception of some traffic jams, delayed flights, bad hair days and slow tours, there was little downside. Early this week though, the weather services started putting out storm and flash flood warnings for today, Thursday. The storm is called a “Pineapple Express” as it originates in the coastal waters off Hawaii and is characterized by heavy rains and warm, balmy weather. Thankfully, the weather warnings gave our crews ample time to prepare the winery for the storm. For the past few days we’ve been cleaning unused storm drains, digging ditches and cutting branches. The cover crop in our vineyard helps to absorb some of the water and our healthy, absorbent soils have been soaking it up as well. It’s a good thing, because when it hit, it hit HARD. Here at the winery, we’ve gotten just under 6 inches of rain in the past 24 hours. Despite much of the county suffering floods, eroding vineyard and garden terraces, fallen trees, mudslides and power outages, we have been incredibly lucky to have experienced none of the above. Many businesses and roads in the county have closed, and many are without power. 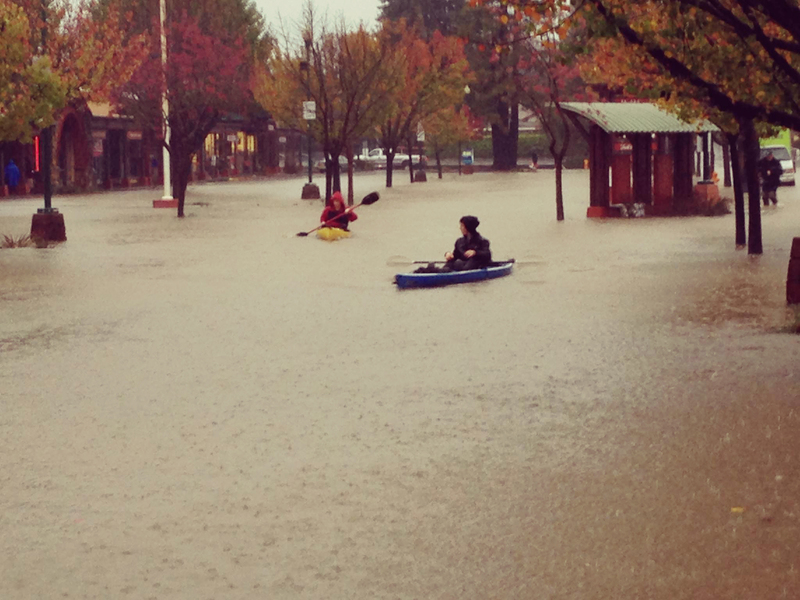 Apparently, the fine residents of Healdsburg are kayaking in parking lots and streets. Does a fierce storm like this end the drought? Not exactly. While it helps contribute to rain totals, it would take a full wetter-than-normal season to officially end the drought. Some have said we would need a year with 150% the yearly average California rainfall. Either way, it feels like the tides might be changing. We are feeling thankful to once again, escape a mighty showing of Mother Nature with little to no damage and some much-needed water for our vineyards and soils. We hope the rain continues (with a little less force) throughout the rest of the year. And we hope you’ll come visit us soon. 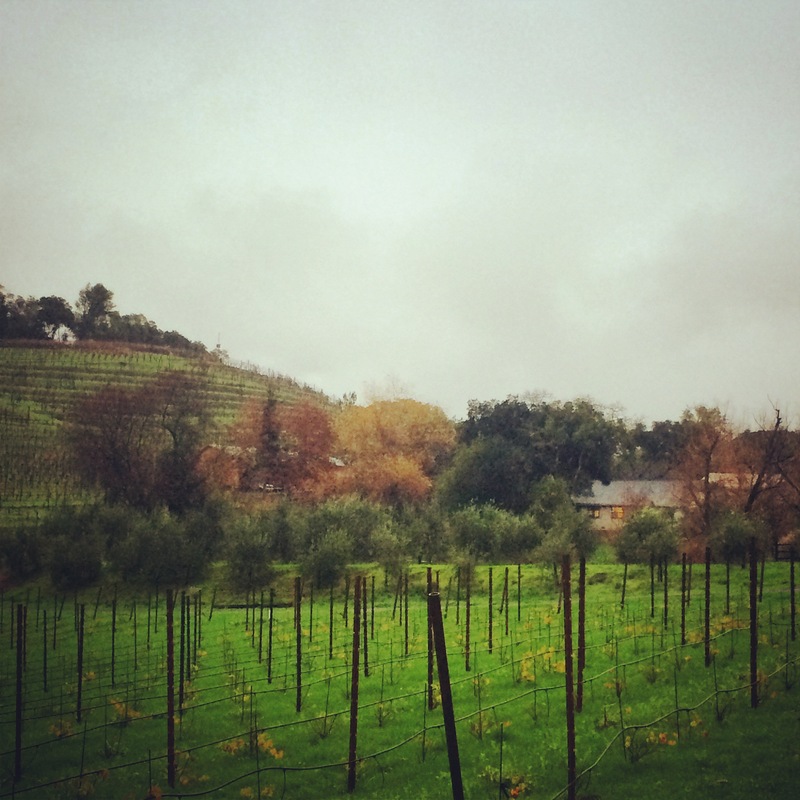 As of this evening, the power is on, and the vineyards are (holiday) green. And to our Bay Area friends and neighbors, please drive safely. It’s really coming down out there. My husband and I visited your winanry and had wine tasting back in early 2000. The hospitality we experienced was wonderful and we loved the taste of all the varieties of your wine. We have not been able to come back in persons but we still drink your wine. Thank you.